Elastomeric, rubber O-Rings are vulnerable to high friction and limited resistance to gas permeation and aggressive chemicals. Solid PTFE O-Rings are rigid and have no effective memory and high compression set. CHEM-RING™ Teflon® encapsulated O-Rings combine the sealing force and resilience of an elastomer with Teflon’s chemical resistance. 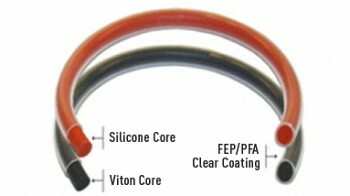 This is achieved using an elastomeric core of Viton® or silicone with a relatively thin encapsulation of PFA fluoropolymer or Teflon® FEP. This results in an elastomeric PTFE seal that features greater sealing capability. While J Royal’s Chem-RING Teflon® encapsulated O-Rings have an elastomeric memory near that of rubber O-Rings, they are solvent-resistant and chemically inert (except for attack by alkaline metals, fluorine and some halogenated compounds at high temperatures). The more routinely prescribed FEP encapsulation also has a very low coefficient of friction (.1 to .2) and extremely low permeability to gases, so that CHEM-RINGS are virtually a universal seal in hostile environments.